Migration is dedicated to crafting Chardonnay and Pinot Noir from the finest cool-climate winegrowing regions to create wines that highlight lush fruit, bright acidity and impeccably balanced oak. Located atop a mesa overlooking the Santa Maria River, Dierberg Vineyard has emerged as one of Santa Maria Valley’s great Chardonnay sites. Grown in sandy soils, Dierberg’s meticulously farmed vines face the full force of the winds that sweep off the Pacific, producing low yields of concentrated Chardonnay. The result is a wine with length and force that is highlighted by bright acidity and beautiful peach, nectarine and white flower aromatics. 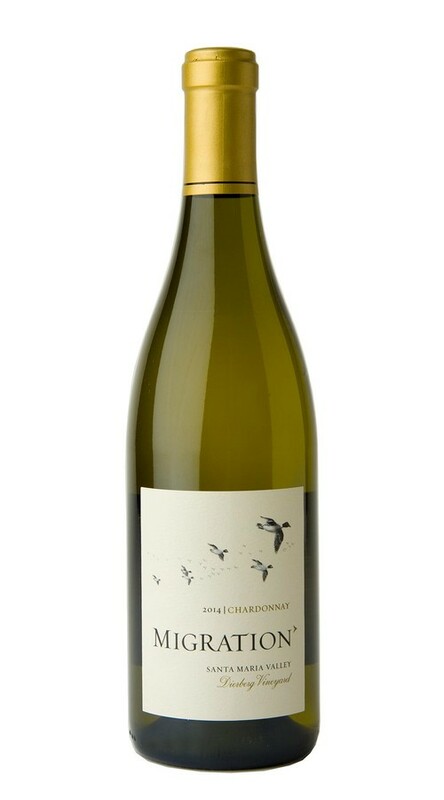 Initial aromas of ripe stone fruit quickly give way to layers of candied lemon peel and honeydew melon. While there is a lovely fruitfulness on the palate, Dierberg’s signature acid profile keeps this wine fresh and bright, providing poise and finesse to the lush flavors, and carrying the wine to a focused finish with an intriguing hint of sea spray. The 2014 growing season got off to a fast start, with the vines awaking early in spring. Though drought conditions continued throughout California, moderate summer weather and a lack of any long-term heat spikes allowed us to avoid any issues. The steady weather contributed to ideal even ripening, and our first pick came into the winery in early August—one of our earliest starts on record. By the time the first rains arrived in late September, harvest was essentially complete. As a result, for the third straight year, the quality of the harvest was exceptional.